I have not been getting much time out there at all. I did get a six-pack each of collard greens, dino kale, and um… cabbage? planted at the north end of the east bed of greens in the last few days. This morning (Tuesday) I hoed an area for the sixpack of… broccoli? I hope it’s the broccoli so I have cabbage in one bed and broccoli in the other. I did the math, sort of, on the spinach this morning and looked up a bit about companion planting. So the spinach would be ok with strawberries. I won’t have strawberries to plant for a few weeks, still. The bed won’t be prepared until this weekend at the earliest. I would love to do this by tractor (with the chisel plow followed by the landscape rake) myself while T is at school, but Z doesn’t want me to use the tractor when he’s not home. Sigh! Plus I might want to have a lot of time in which to experiment and not feel rushed, and I do not get much time in the mornings after I bury/rebury pea seedlings and greens seedlings. Tonight I picked ~1.75 baskets of strawberries. They aren’t in terribly good shape – we are having a heat wave. There are too many plants, too close together, so the bugs have free reign. 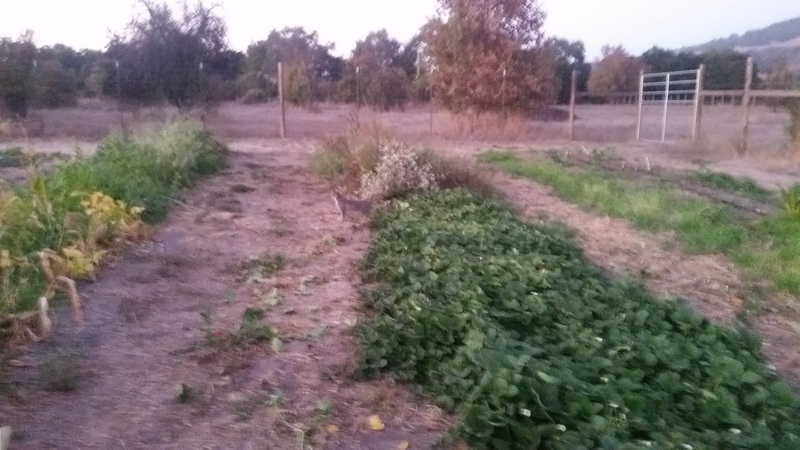 I was very excited to see grey kitty walk through the strawberry bed, about 12 feet from me, when I was finishing up my harvest. She is very pettable. 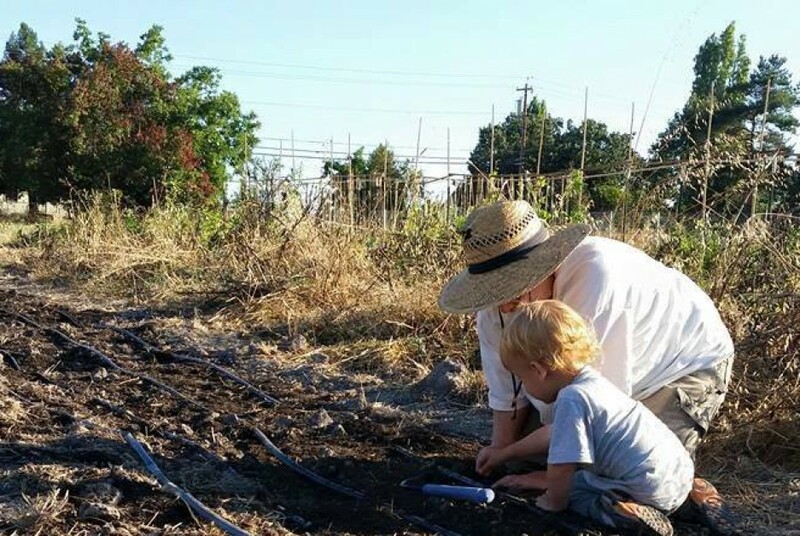 Tonight I pointed out an okra plant that I’d heard a gopher chewing on, and T stood there and watched and listened for signs of it tonight. On one of the last few nights, he was digging up pea seedlings and moving them to different places. Nooooo! < Previous The raccoons have gotten so big!